In my earlier article, I wrote about using bootstrap 3 table classes with GridView. On request from visitors, I am adding this article using bootstrap 4 table classes. Adding bootstrap table with GridView control in ASP.NET web forms needs an extra setting to make the GridView look great. Here I will go over the extra setting required for the GridView control to use the bootstrap properly. 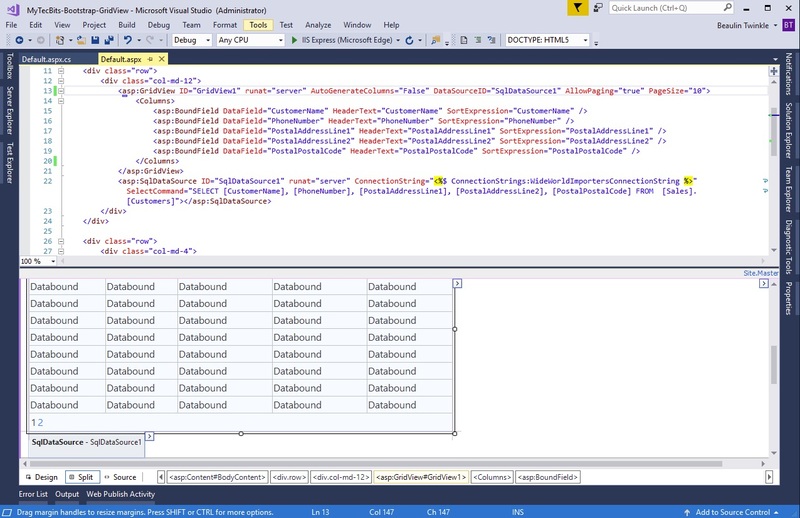 Consider, you have a simple GridView attached to an SQLDataSource in an aspx file. Once compiled the GridView becomes a plain HTML table with rows and columns. But the table does not have a segregated head <thead> and body <tbody> sections. 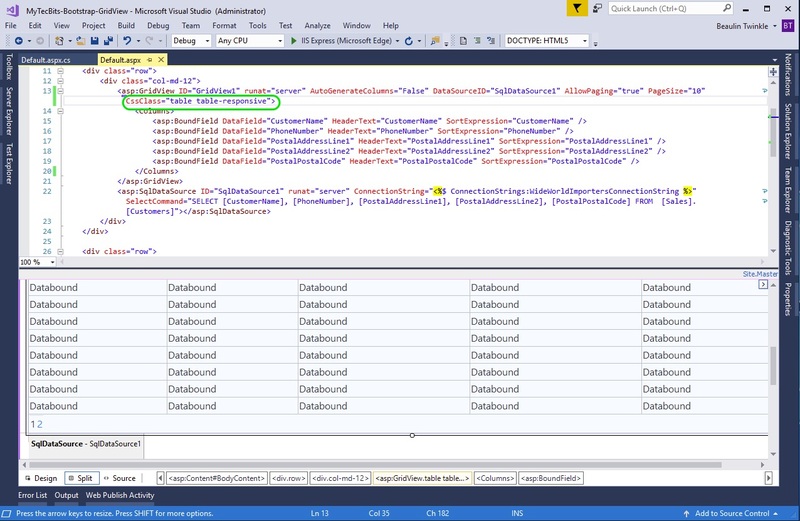 To segregate the table by head and body, you have to add a line of code in the code-behind file. In the code-behind file add the below line of code. (Considering GridView1 is the ID of the GridView). Using the HeaderRow.TableSection property, you can set the location of the table header . This will help the bootstrap class to style the table’s header row and the body rows accordingly. That’s all. You can build and run the project and see how the grid table is formatted. If needed, you can add more bootstrap table classes in the CssClass. Details about adding bootstrap in ASP.NET, both in Web Forms and MVC. Step by step instruction on using bootstrap in ASP.NET Core MVC. 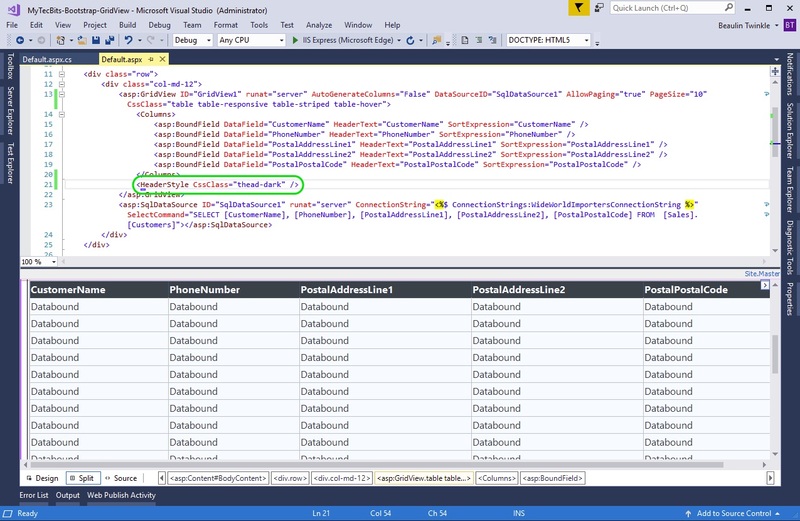 About GridView control in MSDN.